Universal Soccer Academy was established in 2000 with the vision of Coach James Galanis to create a soccer training program for players sharing his same passion for the “Beautiful Game.” From Day 1, Coach Galanis and his staff have continuously built the Academy's training curriculum for the most committed of players, specializing in the individual development of each player at every age and every level. By challenging their students as they continue to improve, the Universal coaches have implemented the curriculum with outstanding results. The Academy has produced players that have gone on to great accomplishments in the world of soccer at all levels - state, regional, national and international. Our location in beautiful rural Burlington County, New Jersey is in the center of the competitive Eastern Region of US Soccer. The proximity of our training facilities to both Philadelphia and New York provides for easy travel locally, regionally and internationally. Students from around the nation and the world attend our clinics and camps each year. 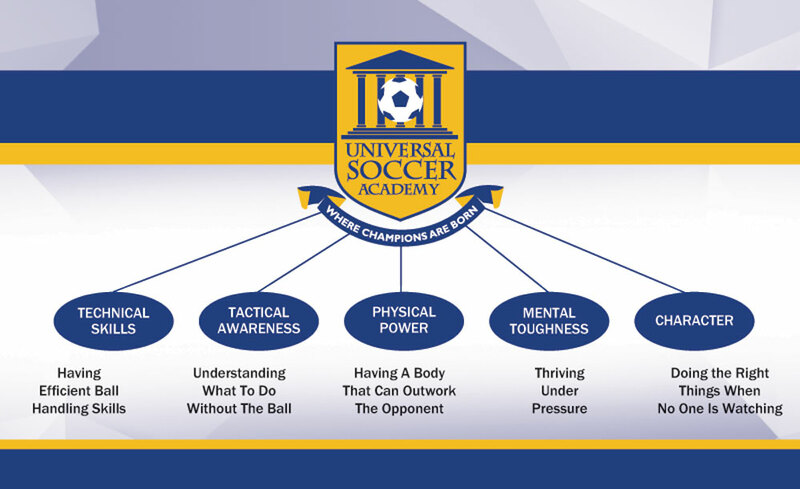 When our students join Universal Soccer Academy, they enter an environment built upon a holistic foundation of values. The solid mastery of soccer skills is only one goal of soccer training. Our success results from our FIVE PILLARS METHODOLOGY of player development: TECHNICAL SKILLS, TACTICAL AWARENESS, PHYSICAL POWER, MENTAL TOUGHNESS & CHARACTER. Following our training curriculums specifically designed with this methodology in mind, our coaches have an unmatched history of developing players and teams that compete at the highest level of youth, collegiate and professional soccer. We are committed to providing world-class, originally-designed training programs in a nurturing environment that allows our students the opportunity to grow as soccer players and as human beings. On the field, our specialized training develops players that are creative, intelligent and impactful with and without the ball. We provide stimulating activities and games where high-level skills and systems of play become instinctual. We challenge our students to build a body that is ready to perform, becoming quicker, stronger, faster and more powerful. Off the field, we relentlessly lead the way in mental performance training by empowering our students to develop the mental tools needed to consistently peak and to develop the mind of a champion. Our students learn the personal characteristics essential to being a positive influence both on and off the field, and they learn how to stay focused on their goals.